Finally, a few peppers. We are going to have to figure out something different with peppers. We started the plants in February, set them out in May, and only now is there anything to harvest. Last night the temperature was in the 40's. Which means only a few more weeks until freezing temperatures, and pepper plants turn to slime when hit by frost. Last year we kept just a handful of plants alive, in just one bed in the hoop house. This year we have at least 100 plants in the ground, outside the hoop house. The yield is about the same. 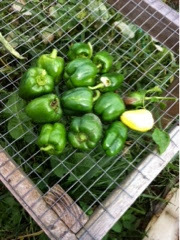 With 40 shares and 100 plants we figured at least 1 pepper per plant each week, 2-3 peppers per share weekly. That has not happened. The hoop house made a huge difference in production: we are going to need a bigger hoop house! And we need to select peppers with the shortest growing time possible. Not hot peppers, we only need a couple of those plants as a little goes a long way. The eating varieties, the bullnose and the bell peppers, we will be working to identify open pollinated types that have the shortest flower to harvest timeline. I'm not allowed to eat commercially grown bell peppers. They have an undesirable effect on my digestive system, one that results in my husband asking me to sleep in another room. But the peppers we grow don't have that effect. We had chili made the other day with our ground beef, tomatoes and peppers. Totally fine with it.